Liberty briefly considered telling her that perhaps the sky-high black patent-leather heels she was wearing, flashing their gaudy red soles as she walked, paired with her tight black dress and a pillbox hat with a veil—honestly, she looked like a 1940s mob widow—were not helping her be inconspicuous at the midwestern service. Though Nora had traveled the world, she remained in New York no matter her physical location. Her New York–ness wrapped around her like a protective gauze, even here at a funeral in the Grosse Pointe Memorial Church. The place was more beautiful, somehow, than Liberty had expected, with its white stone walls, Tudor arches, and ornate stained-glass windows. It felt at least a hundred years old. A comfort, somehow. “I should hope so,” Leo said, flashing a smile at an older woman who had her eyes glued to him as she passed the pew toward the back where the three Lawrence siblings had settled in, Liberty futilely hoping they could keep a low profile. “I mean, the day I don’t stand out from a crowd like this? Euthanasia, I beg you.” Leo was Nora’s twin (Leonardo and Leonora: they were named after royalty and so they behaved), though they hardly resembled each other. “Leo.” Liberty shot him a warning look. “The mood is meant to be somber, Leo. Just . . . please.” Liberty wrapped her arms tighter around herself and faced forward. “Is that her?” Nora said, leaning over Leo’s lap toward Liberty, who was sitting on the aisle. Liberty looked up as a young woman (she was twenty-three, the same age as the twins) walked by to the front pew that was reserved for family. Laila—their cousin, a stranger, the person they had come to see—seemed to be the only person in the church who hadn’t noticed the three of them. Though this was the first time they would meet, Liberty recognized her immediately. She was distinctive: petite and lovely, with green eyes and long red hair. She was fine-boned (as Liberty and her siblings were) and appeared delicate to the point of breakable against the backdrop of the sturdy midwesterners who surrounded her. She clung to the arm of a tall, broad-shouldered man who was wearing a suit that appeared made for someone much smaller, the lip of his boxy white shirt peeking out from the bottom of his jacket as he moved—could this really be her boyfriend? He looked like a high school jock who’d gone to seed but had failed to notice. Laila appeared to be in a fog, eyes straight ahead as she made her way to the pew. Liberty wondered if she’d taken a sedative to get through her mother’s funeral. In her Internet scouring, she’d not been able to find much information on Laila. A Facebook profile, of course, and some photos of her on the website of a local high-end cosmetic dentist’s office. At first, Liberty thought she might be a model—and was struck by the irony of this, that her faraway midwestern cousin would be a model just as she and her own mother had been—but upon further inspection, it appeared that Laila worked at the office. They’d simply taken advantage of having such a comely staff member by putting her front and center on the website. She was not a dentist, it seemed; perhaps a hygienist or receptionist. “It’s so weird that they both went in car accidents, so many years apart,” Leo said. Their uncle—their father’s brother—had died thusly thirteen years before. The two families had grown up estranged from each other. Now Laila was an orphan. “Tragic,” Nora said. “Dickensian,” she added dramatically. “What is our actual plan here?” Leo asked. He was clearly losing patience with the whole idea, which at the outset, he’d found amusing enough. He was bored now and wanted to be back in Manhattan. Organ music boomed through the church and Liberty hushed her brother. The service was beginning. Betsy Lawrence was eulogized by her older sister, Jennifer, a short, round woman with whispers of Laila’s green-eyed wholesome prettiness. It was a strange speech, containing nothing specific about Betsy herself or what the world had lost in her passing. “?‘The body that is sown is perishable, it is raised imperishable,’?” she quoted from Corinthians. “?‘It is sown in dishonor, it is raised in glory; it is sown in weakness, it is raised in power.’ And so Betsy goes home to the Lord. I know my niece Laila wanted to speak about her mother today. I know she loved her dearly. But the shock . . . I’m afraid . . .” She was twisting a tissue in her hands and appeared overcome, standing at the pulpit as though she had no idea how she’d gotten there. After a moment, a man (her husband?) came to collect her, draping his arm around her and shepherding her off the stage. It was an odd moment, but then, it was a funeral. The Lawrence siblings had not been to many—only their grandmother’s and an older family friend or two. The service was brief, and before long, the organ was once again sounding its dirge, and people were standing up and filing out. Before Liberty could come up with a plan, the three of them were pulled along in a tide of people to the church basement where the reception was being held. It was an altogether more modern and sterile space than the grandeur of the hall above, fit for Sunday school and AA meetings. There was subdued string music playing, and officious church ladies were ferrying a large spread—tea, cookies, various hot dishes, and, mercifully, several bottles of wine. Now that the funeral-goers were no longer restrained by the pews, they gawked openly at the Lawrence siblings. “Is this the mom?” Nora said, picking up one of several framed photos arranged on the table closest to the door. The shot was of a young woman who, if not for the teased hair and color-block 1980s sweater, could have easily been mistaken for Laila. They made their way down the line of photos. Even Leo was hushed by seeing these images of the family that had been kept from them. Liberty felt tears coming to her eyes when she got to her aunt and uncle’s wedding photos from twenty-five years earlier. She could see so much of her father in his younger brother’s face, a man she’d supposedly met but had no clear memories of. Their father, Ben Lawrence, never spoke of his brother, Gregory. He’d been gone now thirteen years and all Liberty knew had been gleaned from the occasional overheard conversation in her childhood and what she could discover online, which was not much more than the basics: her uncle had owned a number of luxury car dealerships throughout Michigan, and he and his wife had one daughter, Laila, who was the same age as the twins. Liberty was seventeen when her uncle died; her father hadn’t been an especially warm man to begin with, and the death of his brother had made him even more remote, causing him to retreat further into his work. Repeated searches yielded little more, but Liberty set up a Google Alert with Laila’s name, which was how she’d discovered Betsy’s recent death. And that had brought them here. The three of them moved on to the food and drinks. Liberty poured red wine into the small, sad plastic cups for each of them. Nora examined the food from a distance, as though even coming near it might make her fat. There were piles of cookie bars with numerous layers and frostings, great platters of potato salad with what appeared to be hot dogs mixed in, several varieties of mac and cheese. “Like a TLC show or something,” Leo added. Liberty rolled her eyes and just at that moment felt a hand on her elbow. She turned and the glassy green eyes of her cousin looked up at her. She was small, a half foot shorter than Liberty at least. There was something familiar about her still: the nose, the set of her eyes; she was a stranger, but she was their family. Liberty felt sick to her stomach. A moment before, she’d been contemplating telling her siblings that they should just leave, get in touch later. But now it was too late for that. Liberty gently pulled her sister away from Laila, who was now smiling nervously. The siblings quickly glanced at each other, amazed. Their names had triggered nothing; she knew even less than they did. She looked incredulous. “Ben doesn’t have kids,” Laila said uncertainly, as if she was asking a question. For a moment the three siblings were quiet, because they hadn’t precisely been told about Laila either. Liberty had eavesdropped and eventually told the twins. Laila continued to stare at them uncomprehendingly. A moment later, the man she was with—her fiancé, although their engagement was still a secret—appeared at her side. Liberty watched him subtly lock on her brother as though thinking, Oh thank goodness, a man. “Nathan Jansen,” he said, introducing himself to Leo with a hearty handshake. “Leo Lawrence,” he smiled with relish as surprise came over the man’s pale features. “Liberty,” she followed as Nathan’s eyes ricocheted over to her. “Lawrence? As in . . .” He looked over at Laila. “We’re her cousins,” Liberty said, feeling suddenly helpless. Oh, why had they come? Liberty was mortified to ever be the cause of drama. And at a funeral! Tacky. “We just came to pay our respects, and actually, we’d probably better get going. Laila, you can call me anytime.” Liberty pressed a card into her hand, adding, “My cell is on there. And I would love to hear from you.” Liberty began to shepherd her siblings in the direction of the door. “Okay. I’ll call you later, maybe,” Laila said, before being pulled away by funeral-goers who had been waiting nearby. “It is so messed up that her parents didn’t even tell her we existed.” Nora leaned her head wearily on her brother’s shoulder. They were fitted snuggly in the back of a town car, three across for the twenty-minute drive along the Lake Shore Road to their hotel. Liberty shrugged. Of the three of them, she was closest with their eldest half brother, Beau, but she didn’t hear from him for months at a time and hadn’t told him about their trip. He lived in Banff, a tiny town near Alberta, Canada. “She’s really pretty. I wonder why she lives here,” Nora said. “But that guy she was with. Was that really her boyfriend?” Nora pulled at the waistband of her dress. Her clothes were always a size too small, as though she imagined herself thinner when she bought them. Just then Liberty felt her phone buzz with a text message. Hi Liberty - it’s Laila. When are you leaving? I thought we might meet up tomorrow. Would it be okay if it was just you and me though? I’m feeling overwhelmed. “Just Reece checking in.” Liberty felt strangely protective of Laila. She thought of her standing there next to her boyfriend in the church, looking fragile and faraway. Was that strange aunt with the Bible verses the only family she had left? “I can’t believe we have to spend the night in Detroit,” Nora said as they were getting out of the car. “Nora, hush,” Liberty said, feeling the eyes of the hotel’s doorman on them. She smiled at him warmly and his expression said that she, at least, was forgiven. “My good man!” Leo said, strolling up to the concierge desk where a thin twentysomething who swam in his dark suit lifted his gaze from his computer. “Oh, God, no,” Leo said. “Can you imagine what passes for fine dining in this hellhole?” Nora said under her breath to Liberty, who gave her a sharp look. They both nodded, Liberty smiling, Nora sulking as the concierge showed Leo the restaurant’s location on a map. They were seated in a booth toward the front of Papalis as Leo watched other patrons as if they were performing a cabaret for his amusement. “It’s like being on safari! I should write about this in my column,” he said, meaning his weekly missive for New York magazine’s Man About Town where he mostly chronicled the parties he went to—he’d even sold a book to a publisher off the concept. When their pizza arrived, it was a monstrous thing, like five pizzas crammed together and covered with extra cheese and sauce. “This actually smells pretty delicious,” Liberty said. “Maybe she can come visit us in New York! The poor thing,” Nora said. Liberty knew it was best if she kept her meeting with their cousin a secret for now. Like all siblings—particularly those with nearly a decade’s difference in age—she and the twins had grown up both in the same and completely different households. Their parents had been much stricter with Liberty, imparted different lessons about money and work and privilege. She loved the twins, but they were so woefully naive. She didn’t want to lose her cousin’s trust if they said or did the wrong thing at such a delicate time, which she somehow knew they would. Nora, a bit unaccustomed to having good ideas, beamed. Their flight to New York wasn’t until the next afternoon. That morning, Liberty told her siblings she was going to check out a rare bookstore nearby that she’d read about, thereby ensuring they wouldn’t want to come. At any rate, they were settled into their favorite activity, hotel movies and room service. They were already in robes and unlikely to move for hours, giving Liberty ample time to meet Laila for coffee. Liberty felt stares trailing her as she made her way to a small two-top table in the corner of a nearby café to wait for Laila. It was always worse outside New York. In Manhattan, she wasn’t so out of place, but here she was like another species, so tall and slender, with her miles of legs, high cheekbones, and dramatic brows. She stared at her phone while she waited, avoiding fervent glances and hoping no one would see the open chair opposite her as an invitation. A few moments later, she felt the energy of the room shift and raised her eyes to see her cousin come through the door. She was wearing a royal-blue peacoat that she shook off upon entering. Underneath she had on a tight sweater and jeans, her lovely red hair splashed out across her shoulders; she looked revived since the previous afternoon. Liberty leaned forward and waved to her. She had the impulse to stand and embrace her, but then remembered Laila’s bewildered grimace at Nora’s hug. Laila spotted her and strode toward the table. “Thanks for meeting me.” Laila gave her a weak smile as she settled into her chair, draping her coat over the back. Laila scrutinized her. Liberty realized that her presence was being met with something besides curiosity. Suspicion. “Of course. I’m glad you texted. I’m sorry we just showed up like that. Maybe that wasn’t the right way to . . . ,” she fell off, embarrassed. “Trust me, there’s no right way for anyone to do anything for me right now.” Laila took off her hat and shook out her hair. “Jesus,” she said, looking back at Liberty, “you’re so pretty.” Liberty thanked her, though it sounded more like an accusation than a compliment. Just then the waiter came by and took their coffee orders. Liberty asked for black; Laila ordered a latte, skim, just a dusting of nutmeg. Thank you so much. “Well, New York is like that.” Liberty shrugged. She didn’t think they were in the press that much, but she supposed if you Googled it, if it all came up together, it might seem they were. “Have you ever visited?” The idea that her cousin might have come, worn the touristy path from Times Square to the Empire State Building to South Street Seaport, without ever knowing she had family there, struck Liberty as inexpressibly sad. “You really didn’t know anything about us?” It hurt Liberty that her uncle had taken such pains to deny her very existence. But then, her own father had done the same. What must have happened between the two brothers to have caused such a rift? Liberty tilted her head, waited for her to continue. Had they broken up? They’d certainly seemed like an item the day before. Liberty breathed a sigh of relief that yet another misfortune had not landed on her cousin. “I’m glad you have him. I wish . . . our families . . .” Liberty didn’t know what she meant to say but Laila seemed to understand and smiled kindly at her. Liberty finally found the courage to reach across the table and take her cousin’s hand, which happily, she accepted and squeezed. “What a boring way to die, you know? A car accident.” Laila said. Liberty looked at her, confused, resisting the urge to withdraw her hand. “She sounds sweet.” Liberty’s mother, Petra, also bore no resemblance to this paragon. She loved her children and was devoted to her family, but she’d grown up poor in Russia before emigrating and becoming a top-tier model. She was all hard edges: no baking and certainly no cat sweatshirts. “She is, but . . . anyway. Tell me about New York!” Laila’s eyes lit up, her posture straightened as though shaking off the burdens she’d just enumerated. Liberty smiled, “Not as much as you’d think. I did mostly local stuff because I was really young when I was working.” Her cousin must have gone back a ways with her research. Liberty hadn’t modeled since she was a teenager, and she was thirty now. “That sounds cool. And are you seeing anyone? A boyfriend?” Laila’s expression was girlish; she suddenly looked years younger, the cloud of her grief clearing. Liberty shook her head. “Too busy!” she said cheerfully, the usual answer, the simplest. She was charmed by the childlike bluntness of her cousin’s questioning. “Today?” Liberty said. The task seemed brutal so soon after the funeral. “Okay, then.” Liberty stood and this time hugged her cousin, who smelled like vanilla. They promised to keep in touch, and Liberty walked back in the direction of the hotel. The early-October sun was out and it warmed her face. She texted her best friend, Reece, to see if she could talk, but there was no response. Liberty thought of calling her mother, who didn’t even know they were out of town, just to hear her voice. She was reminded by meeting her cousin that you only had so much time with people, only so many chances to make things right. Holding grudges—as her own father had obviously done with his brother—was never worthwhile. Aunt Jen (the eldest) and Aunt Lisa (the middle sister) had been at her mother’s condo since 9:00 a.m. with a half dozen of their interchangeable dowdy church friends, and they were busy pawing through the remnants of Betsy’s life. “Do you need me today?” Nathan had asked her before she’d set off to meet Liberty—a part of her day’s itinerary that she hadn’t shared with him. His tone made it quite clear that if he was required to help, it would be as a brave martyr on his fiancée’s behalf, rather than out of any genuine desire to be there. It was a Saturday, which meant hours upon hours of college football blaring from the massive, vulgar television that dominated their living room. It meant the house steadily crowding with his brothers—both biological and fraternity—their voices growing ever louder as they consumed more and more beer. “Okay, I’ll just leave you ladies to it, then,” he said, his relief palpable. As though the tossing out of dozens of take-out menus, the sorting of her mother’s vast collection of stretchy pants to determine which were fit for donation and which should just be thrown away, were some fun girly outing his male presence would impinge upon. Not that Laila wanted him to come; there was something deeply humiliating about going through the effects of a middle-aged woman who’d lived alone. She’d succumbed to the sort of squalor in the past several years that showed she’d given up: the fridge full of take-out leftovers and condiment packets; the crusty, expired cosmetics jumbled in the bathroom drawers, long since unused, inexplicably held on to; the trashy romance novels and self-help tomes piled on the window sill. The church ladies squawked around Laila as they sifted through the unfortunate detritus. How was she doing? Did she need anything? They’d brought a massive platter of cookies with them, as though refined carbohydrates could somehow make this task more pleasant. “Honey, there’s a little pile of some nice things we found, some jewelry you might want to hang on to.” One of the ladies pointed her to the dresser in the corner. Laila smiled sweetly and made her way through the chaos. The dresser was in a corner of the room that had already been dealt with and was consequently cleaner than Laila had ever seen it while her mother was alive. There was another version of Betsy buried somewhere in Laila’s memory: the one featured in the photographs at the memorial service. This was the incarnation of her mother whose prettiness and smarts had helped her—for a time, at least—rise above her circumstances by landing a scholarship to the University of Michigan where she met, and soon married, Gregory Lawrence. But that version had lapsed after her husband’s death. The Betsy of the rancid condo where Laila too had spent her teenage years was doomed to be the one who endured in her memory. There were many women who rose to the occasion of single motherhood—in truth, the world would grind to a halt without such women—but Betsy was not one of them. After Gregory’s death, their family was like a rulerless nation—a vacuum that impressed upon Laila the dangerous notion that women were powerless alone. Laila picked through the pile of so-called nice things the church ladies had set aside. Her mother had developed an unfortunate QVC habit in her later years and had accumulated a massive amount of junky costume jewelry. But then it caught her eye—the red enamel pendant with the two golden birds, both of them with diamonds for eyes. It was the one beautiful thing Laila’s mother had owned, and she was shocked to find it here, having assumed that her mother would find a way to take it with her to the grave. Laila didn’t know anything about its provenance, but it was her mother’s treasured possession: Laila had already looked through the apartment once and not found it. Somehow the church ladies had unearthed it. As the day following her mother’s death had dawned, Laila had snuck from Nathan’s bed in silence. She always woke before him, and this morning she’d risen at 5:00 a.m. She didn’t know what exactly she was looking for: only that her mother had been lording some secret over her for years. It was her method of keeping Laila close. “Oh, if you’d only known the life I could have had. But I chose you, my little sweetheart,” she’d say, venomous and sly. Or: “Someday, I’ll tell you everything. Someday you’ll understand what your poor mother has been through.” Laila knew her mother could have easily been bluffing; it was a bit of theater that the two of them went through. Laila continued to see her mother—making sure she took her diabetes meds and keeping her from turning completely feral in her disgusting condo—not because she genuinely thought her mother might have something to offer her one day, but out of a filial duty that she didn’t so much feel as know was expected of her. As much as Nathan wanted no part of this duty, he would have judged her harshly if she’d rejected it herself. And Laila had done well thus far positioning herself as the caretaker Nathan expected her to be: the one who cooked their dinners, folded his laundry, and remembered not only her own mother’s birthday but his mother’s as well. But Laila had woken with a start that morning; if there was something to find, it was she who must find it. And now would be her best chance. And she had found something. Secreted away in an old jewelry box on the top shelf of the bedroom closet was a fragile and crumbling cache of letters from Frederick Lawrence, Laila’s grandfather. She’d not yet read through them—she’d wanted to return to the house before Nathan could realize she’d left and then hadn’t, it seemed, had a moment to herself since then. But the very fact of their existence was revelatory. And the fact that the church ladies had managed to unearth the pendant, the one possession of her mother’s that she’d admired, felt like a small miracle. Out of the corner of her eye, Laila could see her pious Aunt Jen rooting around her dead sister’s things, sorting, judging. These women were no longer all she had left, Laila realized. She had family: an exciting and beautiful family. She’d not been prepared for them to swan into the little Michigan suburb in all of their glory: the dark mane of Liberty’s hair; Leo’s extraordinary green eyes; the flash of red on Nora’s expensive shoes; the shock of them standing next to Nathan. How different he seemed to her throughout the course of that long day of the funeral. That morning, she’d woken next to a savior—a man who’d taken her into his own family when hers had disintegrated. Here was a man who would allow her to quit her dreadful job upon having children. And yet, she’d fallen asleep that night next to an anchor. Someone who would pin her to a place she’d never truly belonged. She’d felt it with a rush upon seeing her cousins. She’d never had a sibling, never had the experience of looking into someone’s face and seeing a shadow of her own. It could not be a coincidence that they’d shown up now, she decided. That they’d come for her. And she felt it even more deeply that morning at the condo, with its cigarette funk that hung in the air, the stained beige carpet, the fussy, fat church ladies bustling around industriously; New York was coming slowly into view, an unanticipated escape hatch. As she headed for the door, she felt a wild fantasy well up: a desire to break every dish and piece of glassware in the place, to set fire to the curtains and leave them blazing in her wake. She would never set foot in here again. Her mother was dead. At last. This reading group guide for She Regrets Nothing includes an discussion questions and ideas for enhancing your book club. The suggested questions are intended to help your reading group find new and interesting angles and topics for your discussion. We hope that these ideas will enrich your conversation and increase your enjoyment of the book. 1. What were your first impressions of the Lawrences (Liberty, Leo, Nora, Laila, Ben, and Petra)? Did your sense of any of their personalities change over the course of the book? How so? 2. On page 62, Laila describes her tendency to transform herself into what she thinks people around her want as “mirroring.” Have you ever found yourself mirroring others? Using examples from the book or your own life, discuss whether mirroring seems like an effective tactic for building relationships, or reaching any other goal. Where is the line between trying to fit in and being manipulative? 3. While wealth disparity creates an obvious distinction in power and influence, She Regrets Nothing also portrays the way beauty and youth can be strong sources of privilege. What are some of the instances in the novel when the clout of wealth, beauty, and youth are at odds with each other? Do you think one holds more sway over people than the others? 4. There are several examples of the different timelines men and women seem to be given for settling down, from Reece’s surprise that her brother Cameron would be interested in having a family when he is “only thirty-six” (p. 102) to Petra’s insistence that Nora use a matchmaker to find her a husband since her “options won’t get better” (p. 45) now that she is twenty-five. When Nora insists that things have changed—that men don’t only want twenty-five year olds, and that women can find good husbands at older ages—Petra suggests everyone is only pretending things aren’t the way they were in her day. Do you agree with Petra, or do you think she is overstating the matter? What are some other examples from the book of the consequences of the divergent expectations for men and women? 6. On her way to Thanksgiving dinner with her cousins, Laila reassures herself by mentally iterating some of the glamorous facts about her current life, noting that “as she formed the words in her head, they felt true and not true.” What do you think she means by this? 7. As a young, pretty Midwesterner, Laila is seen as naive and unassuming by the more urbane New Yorkers around her. Although at times she takes advantage of the impression people have of her, Laila does express frustration at not understanding the rules of the new social world she is in. What are some of the moments in the book where the reader sees her ignorance? Ultimately, to what extent do you think Laila feigned the role of a clueless small-town girl, and to what extent was that really who she was? 8. The novel seems to distinguish between characters who wear their privilege and status well, and those who do not. What are the hallmarks of each type of person? What are both the external circumstances and innate qualities that seem to make some individuals—Liberty, Reece, Blake—more redeemable than others? 9. Laila is in many ways a fiercely ambitious and emotionally independent woman, and yet repeatedly finds herself financially dependent on the men in her life. Is there power in being a “kept” woman? Which do you think grants greater freedom: working a job that isn’t your passion and supporting yourself, or never having to work again but being tethered to a man you aren’t in love with? 10. In chapter 18, Leo and Nora imagine leading idyllic “normal” lives outside of Manhattan, conjuring cinematic images of an upper middle–class existence. What would your perfect life be like? Do you think there is an ideal level of wealth that provides comfort and opportunity, but avoids the types of problems Leo, Nora, and Liberty believe having an abundance of money creates? If so, what would that look like, and is it different from the fantasy life you initially imagined? 11. Do you think Laila deserves a portion of the Lawrence fortune? Did Liberty deserve the money? Why, or why not? 12. In the epilogue, Laila envisions herself as a “beautiful, young, unencumbered” girl with “only the brightest of futures . . . unstoppable and untethered . . . She is the master of her fate, and she regrets nothing.” Do you think Laila really has no regrets, or does she just wish to be the girl she is describing? 1. Put the “club” in book club—consider having everyone in your reading group come made up in their “Manhattan socialite” best. Put together an outfit fit for an exclusive nightclub in New York City, crack a bottle of champagne to share, or bring some New York-style cheesecake bites to add a flare of luxury to your discussion. 2. At the end of She Regrets Nothing, Laila is on a flight to the Maldives to escape New York and make a fresh start. Imagine what will happen in her new life. Will she live with Maxime or find another way to survive in the Maldives without any money? Will she settle down or keep moving, leaving another life behind? Will she ever find a way to maintain the luxurious lifestyle she craves? Will her actions in New York catch up to her, and will she ever regret her choices? Consider writing a denouement that addresses some of these or your own questions about Laila’s future, and share with your reading group. 3. Consider reading the New York Times opinion piece, “What the Rich Won’t Tell You” (https://www.nytimes.com/2017/09/08/opinion/sunday/what-the-rich-wont-tell-you.html). What are some parallels between how the interviewees discuss and/or justify their wealth, and how the characters in She Regrets Nothing view their own abundance? What differences do you see? The New York Times article takes a strong position on the rhetoric and behavior of the upper class—do you agree with the author’s point of view? How might some of the Lawrences respond to reading this? 4. 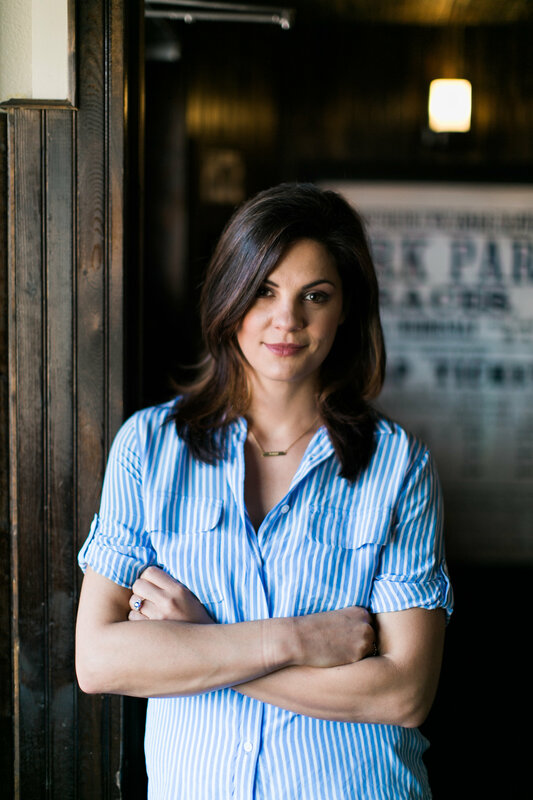 Visit Andrea Dunlop’s website at www.AndreaDunlop.net to learn more about her and her books, and consider reading her debut Losing the Light or her enovella Broken Bay for another darkly seductive read. "She Regrets Nothing is the love child of Gossip Girl and Crazy Rich Asians, plus the social climbing of a Gatsby party." "Readers who follow New York trends will enjoy the stories of fashion, clubs, and restaurants Dunlop builds to a gripping climax while delving into questions of family, loyalty, lust, wealth, power, and betrayal." "She Regrets Nothing made me feel like I'm back in high school, staying up late to finish that special book, the one that's part enriching classic family saga novel assigned by the teacher, part salacious, nasty page-turner about impossible rich kids. Andrea Dunlop infuses this story with insight into family dynamics, which makes She Regrets Nothing especially rich and multifaceted, engrossing. Fans of Becky Sharp and Brenda Walsh, this is your lucky day." "Laila Laurence and her family are people I am thrilled not to know personally and was equally thrilled to spend a few hours following around New York City in all the best clothes and shoes to all the best clubs and parties. She Regrets Nothing is addictive, dark, and twisty and, like its characters, delightfully conniving." "Get ready to drop everything and lose yourself in how the other half lives. Andrea Dunlop's deliciously addictive new novel has it all: old money, big secrets, a privileged family, and a ruthless social climber trying desperately to shed her arriviste status and become one of them. A spot on social critique with perfectly executed plot twists, She Regrets Nothing is modern day Edith Wharton meets Gossip Girl. Blair Waldorf would certainly approve." "Andrea Dunlop has done it again! As she did so well in Losing the Light, Dunlop has created unforgettable characters and a setting so richly drawn, the reader is immersed in the drama until the last engaging page. 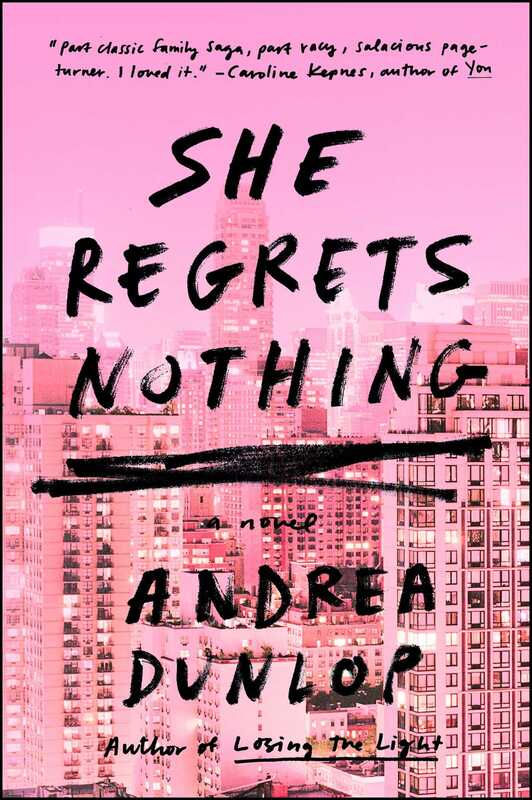 She Regrets Nothing is an entertaining, compelling story of family, class, and the yearning to belong."